Car body shops in Toronto are vehicle owners first line of defense after accidental scrapes, scratches, and collisions. Did you know, however, that it might not always be in your best interest to use a car body shop recommended by your insurance company? Not all body shops in Ontario are capable of carrying of carrying out repairs on every car make and model. Worse, many body shops will charge higher fees, just because they are listed by local and national insurers. This is why it will often always pay for vehicle owners to reach out to auto body repair shops directly. In winter in Toronto, collision auto body repair services are in high-demand, as drivers fall foul of icy road conditions and reduced road visibility. Thankfully, at Auto Detailing Pro in Toronto, our specially trained car repair experts can professionally restore any vehicle make and model to its full aesthetic (and functional) potential. Moreover, we don’t just specialize in auto repair work following minor road traffic accidents. From remediation of rust to more generalized auto repairs, our body shop provides preventative maintenance services, classic car restorations, auto glass replacement services, and much more. At Auto Detailing Pro, we make minor and more extensive auto body repairs as easy and stress-free as possible on vehicle owners. 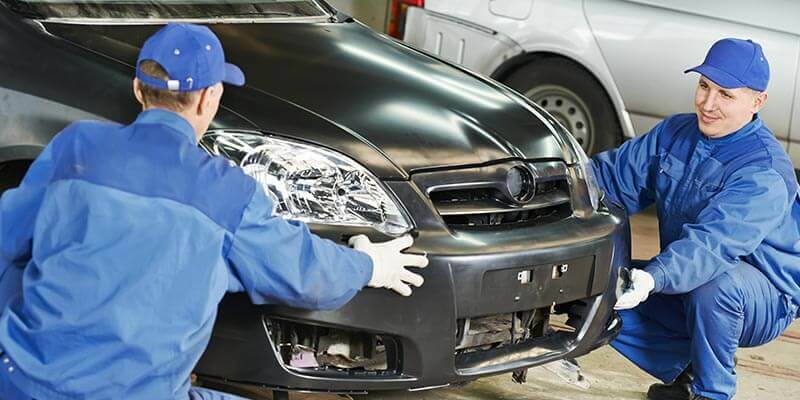 Whether you have suffered a minor bump or are in need of more extensive bodywork, we will do everything we can to restore your vehicle’s looks, whilst also ensuring the safety and roadworthiness of your car. Designed to prolong the functional and aesthetic life of your vehicle, our Toronto body shop regularly works with prestige car brands such as BMW and Mercedes. This means that whether you have a simple scratch or more considerable fender damage, we can help get you back on the road, regardless of the make or model of the car you’re driving. Professional scratch repair, paintwork restoration, and more extensive bodywork isn’t always enough to make a vehicle roadworthy after an accident. The good news, however, is that in striving to be the best auto body shop in Toronto, we offer full mechanical repairs, as well as just aesthetic car restoration services. Using only manufacturer approved parts, we can accommodate the replacement of vehicle mechanical components, windshield glass, headlights, and much more. After the trauma of an accident, people looking for auto body shops in Toronto, will also have to deal with the added stress of managing their personal transportation needs while their car is being repaired. Thankfully, at Auto Detailing Pro, we can arrange pick up and delivery of vehicles in need of body and general repair work. Much more importantly, as well as ensuring that all repairs are carried out to the highest possible road safety (and aesthetic) standard, we also strive to complete body shop repair work as expeditiously as possible. At Auto Detailing Pro, we provide extensive collision auto body repair services, tailored to the precise bodywork requirements of each of our Toronto clients. Whether attending to paintwork restorations or more extensive bumper and car glass replacements, our aim is to always get you back on the road as quickly and as safely as possible. Are you looking for a cost-effective, fully professional body shop in Toronto? If so, let us help. Reach out to us at Auto Detailing Pro today, and we’ll provide you with a completely free, no-obligation quotation for your upcoming car repair. .